Stop overpaying for weak, flavorless chili powders and make chili powder at home instead. Homemade chili powder is infinitely better than anything from the store. You control the flavor and heat. 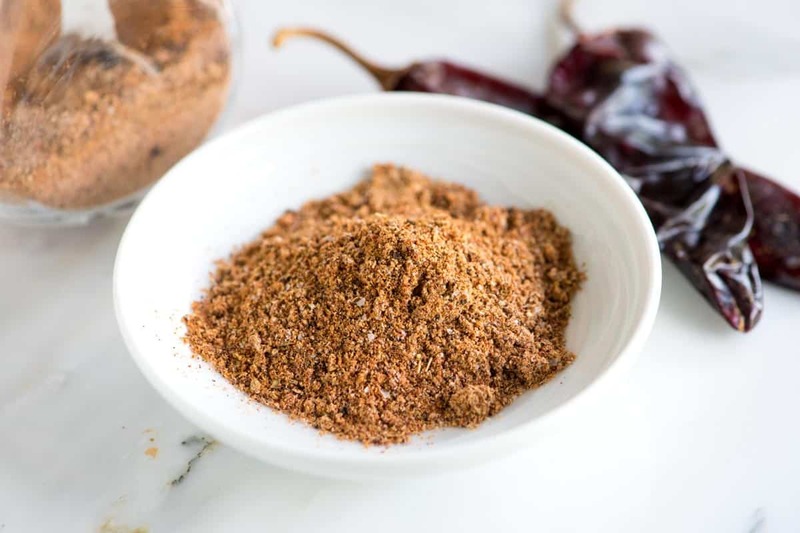 Below we’ve shared our best tips for how to make chili powder at home as well as our favorite blend. 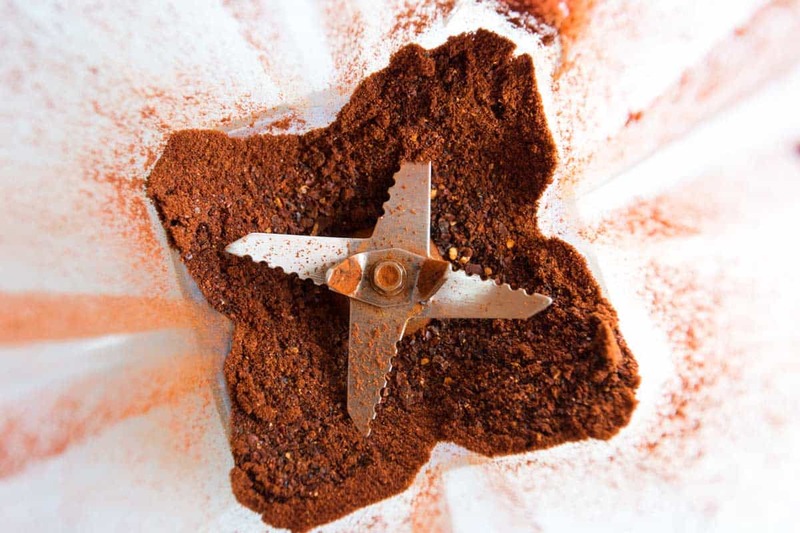 Jump to our Homemade Chili Powder Recipe. Or, read on to see our tips. We use chili powder a lot. We use it in this chicken tortilla soup, these delicious shrimp tacos, our turkey chili and this utterly delicious bean chili recipe! 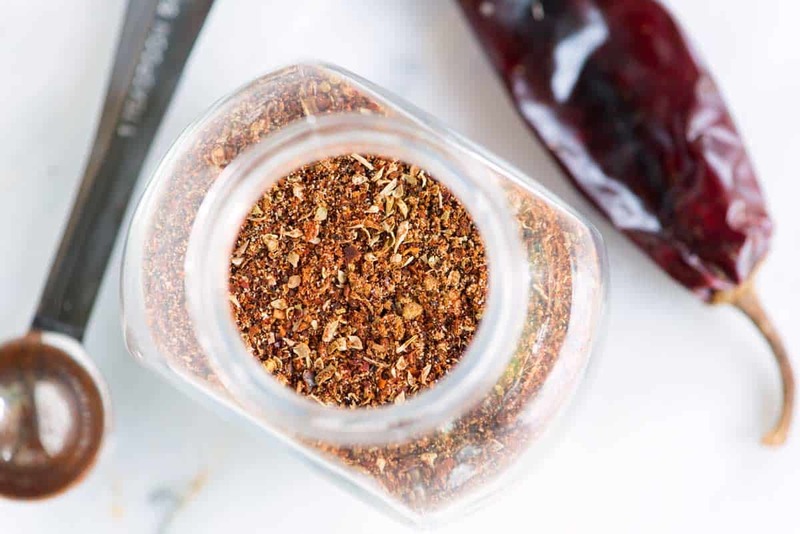 We love using ground chiles and blended chili powder so much, we figured out how to make our own signature blend. We are hooked. Food coming out of our kitchen has never been better. 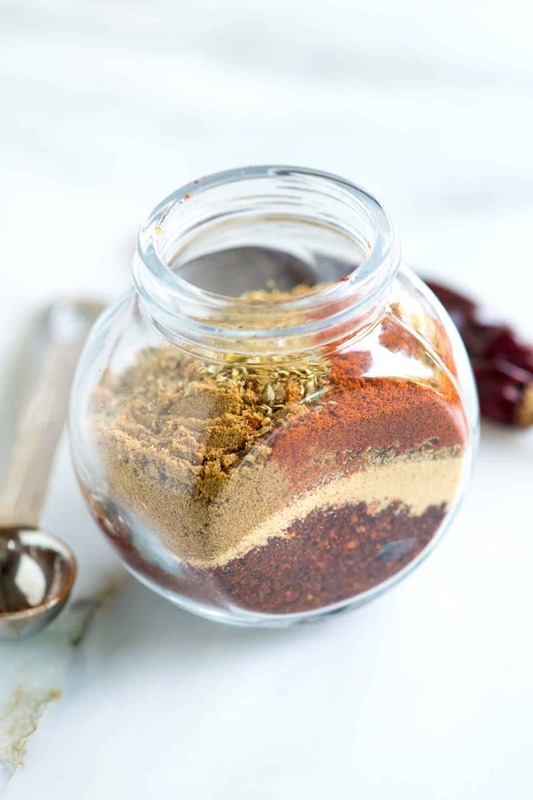 YOU MAY ALSO LIKE: Learn how to make our Secret Ingredient Taco Seasoning Recipe. 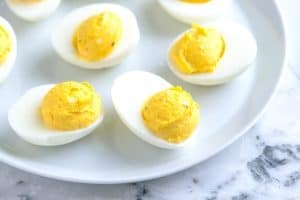 It’s so much better than anything sold in stores and simple to make! The taste varies from blend to blend. This is why homemade chili powder is better than anything at the store. You will need dried whole chile peppers. They can be found in most large supermarkets and any Latin market. There’s lots to choose from, so we’ve shared a list below of the chiles you are most likely to come across. Ancho, Mulato and Pasilla peppers are sweet and fruity. The aroma reminds us of raisins, chocolate, and coffee. These are mild. New Mexico peppers (also know as dried Anaheim, California, or Colorado) smell sweet and fresh — like bell peppers. They can be hotter than ancho chiles, but still are on the mild side. Chipotle and Guajillo peppers are smoky. Chipotles are smoky because of the way they are dried and have quite a bit more heat. Guajillo peppers have a natural smokiness and are moderately hot. Cascabels, Pequin, and Arbol peppers are hot and pack a punch. 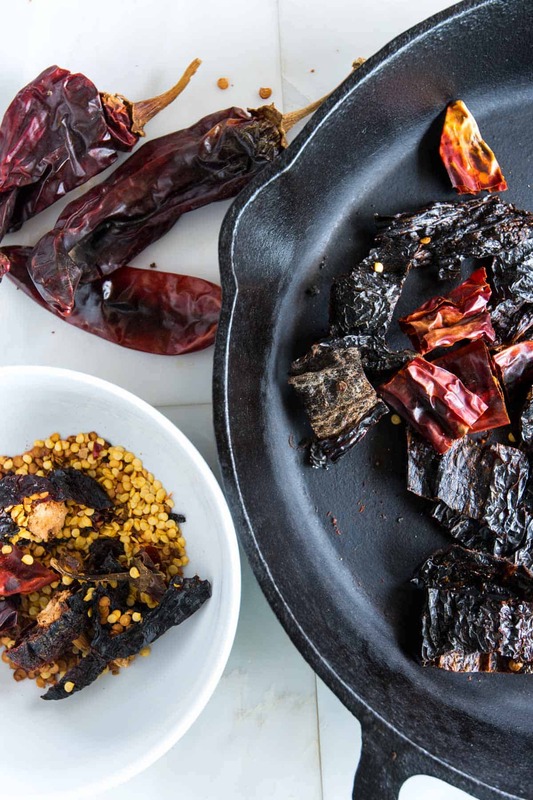 In our recipe below, we call for three varieties: ancho, New Mexico, and Guajillo. It is up to you which chile peppers to use. We recommend including peppers from the sweet and fruity category. They add complexity and flavor (in our case, that is the ancho pepper). Chili powder vs. cayenne pepper? Chili powder and cayenne pepper are not interchangeable. Cayenne pepper is made from chiles, but it is much spicier than the chiles above. 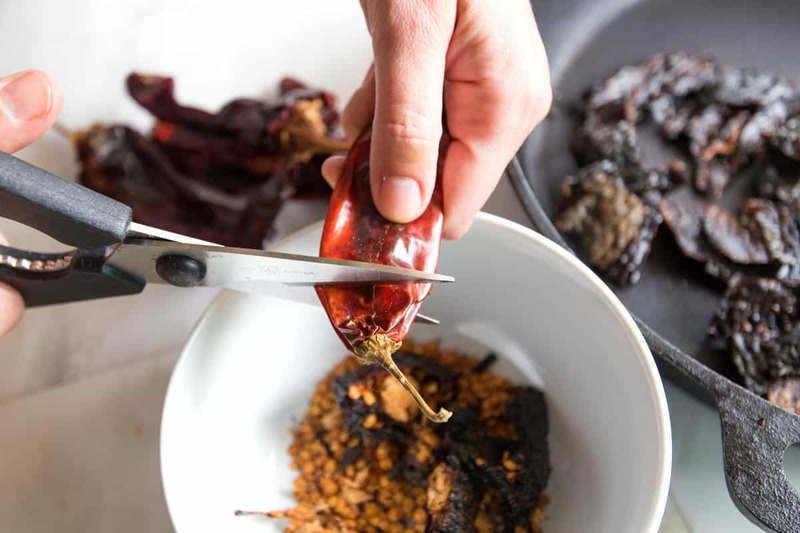 There’s three simple steps for preparing the dried chiles for your own chili powder. Cut the stem and remove the seeds. The seeds can be bitter, so get rid of them. Use a pair of kitchen scissors to cut the stem away and then shake or scrape the seeds from the inside of each pepper. Cut each cleaned pepper into small pieces then add to a dry skillet over medium heat. 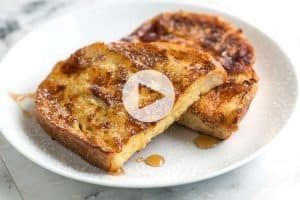 Toast them in the pan until fragrant; about 5 minutes. This is my favorite part, the kitchen smells incredible! Finally, grind them. Add the toasted chile peppers to your blender and blend until finely ground. Don’t open the lid immediately, though. Let the dust settle for about a minute after grinding. You don’t want a cloud of ground chiles in your face. Now it’s time to add spices to make the chili powder sing. In our recipe, we add garlic powder, ground cumin, oregano, and hot smoked paprika. 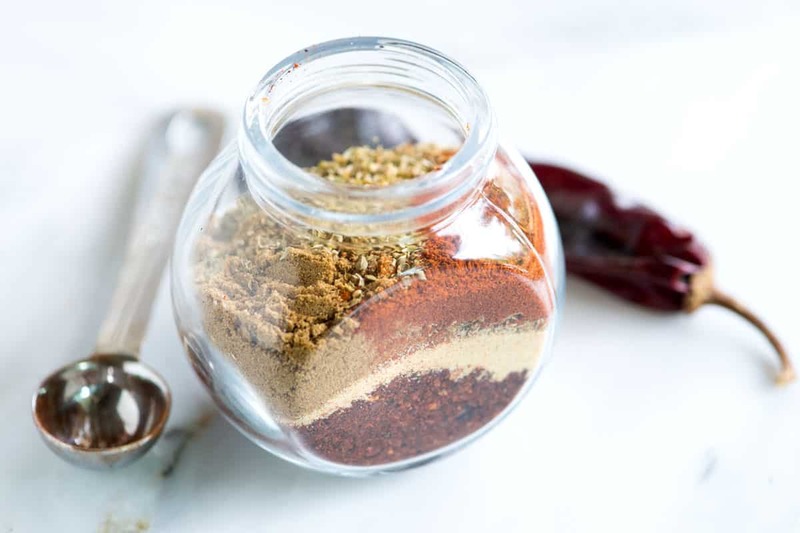 Add everything to a spice jar, shake it up, and store in a dark pantry up to 6 months. You can play around with other spices if you like. Onion powder, a little heat from cayenne pepper, or sweet paprika are great options. Find dried whole chile peppers in most large supermarkets and any Latin market. We use three varieties. Ancho chile peppers are sweet, fruity, and mild. New Mexico chile peppers are fresh, clean and mild. Guajillo chile peppers are smoky and medium hot. You can swap or add other peppers based on what is available to you. We recommend including something that’s sweet and fruity. They add complexity and flavor (in our case, that is the ancho pepper). Cut the stems and remove the seeds from peppers. 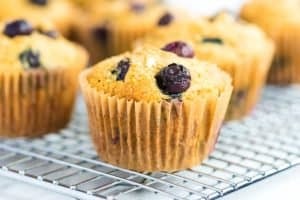 The seeds can be bitter, so get rid of them. Use a pair of kitchen scissors to cut the stem away and then shake or scrape the seeds from the inside of each pepper. (If you have sensitive skin, wear gloves to prevent the oils from getting on your hands. Also, be careful not to touch your eyes during or after working with peppers). Cut each cleaned pepper into small pieces then add to a dry skillet over medium heat. Toast them, stirring occasionally until fragrant, about 5 minutes. Add the toasted chiles to a blender and blend until finely ground. Leave the lid in place until any dust settles so you do not get a cloud of ground chile peppers in your face. Add ground chile peppers to a spice jar then top with the cumin, garlic powder, oregano, and hot smoked paprika. Seal the jar then shake. Store the chili powder up to 6 months. 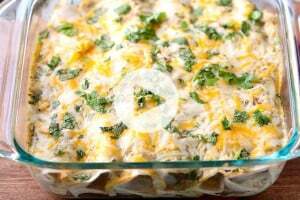 This recipe was inspired and slightly adapted from Alton Brown’s recipe. It was him that gave us the confidence to experiment with different peppers. Take a look at our breakdown of dried peppers above and experiment for yourself, each pepper listed will add slightly different notes to the blend. I made some chili powder using the ancho chile and other spices, however i didnt toast the chili first. Somehow i misunderstood the instructions about the peppers,but my chili came out good though. Thanks to you Adam & Joanne. I’m able to get Chile’s you’ve listed and a few other varieties fairly inexpensive locally. I toast whole cumin seeds before grinding also. I haven’t had the opportunity to use what I’ve blended yet but it smells wonderful so I’m positive it will taste so much better then the store bought – by miles. 5 stars for that alone. Thanks for posting and including info on the types of Chile peppers, etc. Very helpful. I’m thinking this would make great gift jars too. Delicious! I added a teaspoon of dill and it enhances the flavor. I have a question on how much of this do you use for your chilli? Hi Paul, We usually throw in 1 1/2 to 2 tablespoons for a big pot of chili. Excellent piece. I have done a lot of blending lately and am always interested to read other takes on layering the heat in chile powders and other blends. Thanks.